Europe in 1618 was riven between Protestants and Catholics, Bourbon and Hapsburg--as well as empires, kingdoms, and countless principalities. After angry Protestants tossed three representatives of the Holy Roman Empire out the window of the royal castle in Prague, world war spread from Bohemia with relentless abandon, drawing powers from Spain to Sweden into a nightmarish world of famine, disease, and seemingly unstoppable destruction. "A book which is, and will long remain, the standard authority on the subject...I doubt if there is anything in any European language which covers the ground so comprehensively and so satisfactorily." "[Wedgwood] tells a story supremely well....she is by far the best narrative historian writing in the English language. She is a superb stylist, her eye for colorful detail is unerring, and she has an unrivaled capacity for catching the signs and sounds and smells of the past." "The greatest narrative historian of the twentieth century, Wedgwood told complex stories in precise, human terms. The formal perfection and clarity of her prose often recall the work of one of her heroes, Edward Gibbon. Yet she contemplated and described in rapid, vivid detail scenes of past and present horror that would have robbed even the unflappable historian of the Roman Empire of his marmoreal calm. The Thirty Years War shows her at her epic best." "This is a masterful narrative, written by one of the great exponents of that all-too-rare skill. Threading her way through one of the most complex and fraught eras of European history, Wedgwood gives all who have followed her an object lesson in clarity and readability that has not been surpassed." -- Spectator "[Wedgwood] tells a story supremely well....she is by far the best narrative historian writing in the English language. She is a superb stylist, her eye for colorful detail is unerring, and she has an unrivaled capacity for catching the signs and sounds and smells of the past." -- Lawrence Stone "God, I love this book. It's the history of an utterly depressing war with no real nobility that ultimately descends into cannibalism. Right up my alley." --Ta-Nehisi Coates, "My 10 Favorite Books," T: New York Times Style Magazine "The greatest narrative historian of the twentieth century, Wedgwood told complex stories in precise, human terms. The formal perfection and clarity of her prose often recall the work of one of her heroes, Edward Gibbon. Yet she contemplated and described in rapid, vivid detail scenes of past and present horror that would have robbed even the unflappable historian of the Roman Empire of his marmoreal calm. 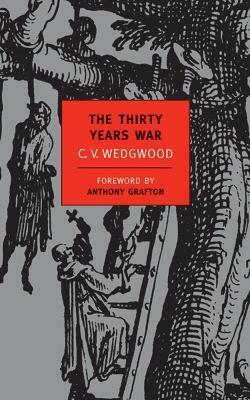 The Thirty Years War shows her at her epic best." -- From the introduction by Anthony Grafton "This is a masterful narrative, written by one of the great exponents of that all-too-rare skill. Threading her way through one of the most complex and fraught eras of European history, Wedgwood gives all who have followed her an object lesson in clarity and readability that has not been surpassed." Cicely Veronica Wedgwood (1910-1997) was born into an innovative and intellectual English family. Her father, a direct descendant of the potter Josiah Wedgwood, was the chief general manager of the London and North Eastern Railway and her mother was a novelist and travel writer. After success at Oxford, Wedgwood rejected an academic career and took up writing instead. She published her first history, The Thirty Years War (1938), before her thirtieth birthday, and in the years that followed wrote a succession of chronicles of seventeenth-century Europe that made her one of the most popular and best-known historians in Britain. Her most important works include The King's Peace; The King's War; and William the Silent: William of Nassau, Prince of Orange, 1533-1584, which won the James Tait Black Memorial Prize for biography in 1944. She was a member of the Institute for Advanced Studies, a Dame of the British Empire, and in 1969 became the third woman to be appointed a member of the British Order of Merit. Anthony Grafton is Henry Putnam University Professor of History and the Humanities at Princeton University. His most recent book is The Culture of Correction in Renaissance Europe.